Naturally, it was a fabulous surprise to get the news that I’d won a Jerwood Fiction Uncovered Prize. And what a brilliant prize it is. The money (£5,000) is, of course, a lovely bonus, but what is most useful and impressive is the amount of promotion and publicity that the prize entails. The thought that I’ll actually see my book in shop windows again is a tremendous boost. I have often had complaints from readers who have found it hard to find my books in shops, and in some cases even know that I have a new novel out, so this promotion and publicity will be a marvellous advantage. The idea of a prize that is not directed towards existing best sellers or new literary sensations but focuses on ‘emerging and deserving’ British writers, including those who have become overlooked, often in mid-career, casts a fantastic shaft of light into what has become for some of us rather a murky landscape. I admire too the egalitarian nature of the prize, by which £40,000 is shared between eight writers. We can all therefore enjoy the prize ceremony without too much anxiety, jockeying or potential disappointment, and feel glad for and interested in each other. It’s particularly refreshing that this prize that is directed solely towards British writers – and many of us will be seriously grateful for this focus. Like many mid-list authors, I’ve found my fortunes slipping in the past few years, abandoned by my mainstream publisher for not selling enough copies, out of fashion (though with a loyal and puzzled readership), out on a limb, just generally out. Although sad and let-down, of course, I found myself in such good company in this fix, that I have been able not to take it entirely personally. Rather than give up, I decided instead to try and find some sort of advantage in my change of circumstances and have achieved this in two ways. Secondly, I decided to see the ‘sacking’ as a form of freedom in terms of my writing. For the last few books with my main-stream publisher I had felt a subtle pressure to write something a bit different, to move away from my own style of gothic, darkly humorous novels towards something approaching the psychological thriller, with more ‘normal’ characters (this last was actual advice). In other words, to write something more marketable. Being dropped meant I could stick two metaphorical fingers up and write exactly what I wanted, just as I had when I first started writing. And this rather exhilarating freedom enabled me to return to Little Egypt, a book I’d been struggling with for years for several reasons, important amongst which was a suspicion that my publisher wouldn’t like it. So, set free, I wrote just what the hell I wanted, just the way I wanted to and sent it to my agent not expecting very much. I was lucky enough to have my previous novel, Chosen, published by the wonderful Tindal Street Press, now subsumed into Profile; and Little Egypt taken on by Salt, who are an absolutely perfect publisher in my eyes. Never have I felt so involved in the whole process not just of editing, but of being consulted at every stage of decision making and design. Salt have made a wonderful job of Little Egypt and I am as delighted for them that I’ve been honoured with a Jerwood Prize, as I am for myself. I am part way into a new novel now, and the prize has given me a surge in confidence as well as in funds, so that I can’t wait to get back to writing just what I want, just the way I want to. 1 You have had 13 books published by major houses, which, for most of us reading, is the ultimate dream. How do you view writing? As a job or a compulsion. 2. Do you enjoy the writing process? Do you have any rituals? Sometimes I love it; sometimes I loathe it. There is nothing like the satisfaction when it is going right and nothing like the frustration when it isn’t. I prefer to be alone when I’m writing. I like quiet and space and privacy to pace about and speak it out loud, or laugh or groan. If there’s no one else in the house I feel as if my face drops off and I’m not quite a person, in the social sense, any more. If there’s anyone else there I feel constrained. If I’m writing a particularly difficult bit, or just needing to work but feeling delicate, I nurse myself, get into bed with a hot drink, hot water bottle and write from there. Bed is a good place to write from - sometimes the dreams are still hanging around. 3. Which authors would you ascribe as influences? Woolly answer I’m afraid, but it’s hard to say. There are writers I love: Elizabeth Taylor, Jean Rhys, Barbara Pym, Dickens, Ford Madox Ford, John Updike, I could go on and on! But I think really that everything I’ve ever read has probably had some influence, good or bad, and this is the same for any writer. 4. What do you think of the Scottish Crime Noir? I noticed your were popping off to Arran with Val Mcdermid and Denise Mina. That must of been enormous fun. 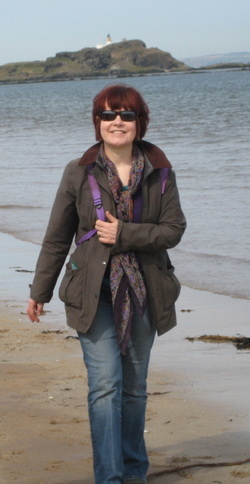 It was Colonsay actually, and there was Val McDermid, but not Denise Mina. Christopher Brookmyre was there too. It was enormous fun to hang out with them. But I have to admit that I’m not much of a reader of crime. An interesting question though is why so much dark, crime fiction is emerging from Scotland. Perhaps something of the legacy of James Hogg, and Robert Louis Stevenson? 5. An English writer in Scotland? How did you get here? I am married to a Scot! But ever since I was a child I’ve had links with Scotland – I actually started school in Glasgow as we lived there for a few years when I was a child. And every summer we’d drive to Skye or some other beautiful part of Scotland for our holiday. I have been spending summers in Orkney for the past seventeen or so years and working in Scotland for 7 years now, so it feels quite natural to me to be here. I live in Edinburgh, a city I love. I have a son and two little granddaughters who live near Fort William and another son in Glasgow. It’s a great country. It does make me feel ‘English’ in a way I didn’t feel particularly when living In England – and that is interesting. 6. You are a teacher of creative writing at St. Andrews University. That is quite an achievement in itself. What aspects of teaching your subject do you enjoy most? I enjoy the students. It’s privilege to get to know such bright, creative people and I enjoy watching their work develop – when it does! Some of them are quite humblingly brilliant. I also like the contact and the feeling of dipping my toe into the outside world. I have had patches when I have done nothing but write and I think there’s a danger of staleness, and a sort of agoraphobia setting in. After weeks of talking to no one but family and living a largely imagined life, it can be quite hard, almost frightening to face the world; so a place to go with an office and a pigeon hole with my name on it, colleagues, students and all the rest of it help me to feel properly human. On the other hand, I do rather wish I taught something other than creative writing. But I don’t know anything else! Being so focused on explicable aspects of the craft of writing in the work of others makes it more difficult to lose myself in my own story worlds without self-consciousness. For this reason, I rarely write first drafts while teaching. I only teach for one semester a year, so I have plenty of writing time too. An ideal balance. For the above reason, I’d advise any would-be writer to learn another trade, or skill, or find another profession, so that they can bring something other than writing back to their writing. Plan on finding a way to pay yourself to write, in case no one else does! 7. How do you keep focused during writing. On the best days, focus is no problem. I put in earplugs if my husband’s in the house and playing banjo. Otherwise just plain old-fashioned will-power. 8. Your husband is also a well-known poet and author - does he read your work and help with the re-write process? I don’t show Andrew my work until it is as polished as I can make it on my own. Then he is my first reader. I can’t bear to let anyone read anything when I know there are problems with it – a bit hypocritical perhaps for a teacher of creative writing! Andrew shows me his work as he goes along. He needs encouragement to carry on; I need privacy. Both of these, of course, stem from insecurity. Show me a secure writer and I’ll eat my desk. 9. What about rejection? Do you think the way we handle it as writers is about personality? The more sensitive we are the harder we find it? 10. What gets you excited when you read a book? I want to forget about the craft and just become submerged in the story. I can’t do this if the prose is weak or if it is too self-consciously showy. I want characters I care about, and stories that make me need to know what happens next. I want to believe in a story world, whether familiar or alien and I want emotional satisfaction at the end. If I’ve laughed and or cried in the process, then that is perfect. 11. What do you feel about self pub authors flooding the market? I buy ebooks but always commit to the ones I love in print too. I like the democracy of everyone having a chance. Until recently the big publishers and book-sellers had too much influence on what the reading public were directed towards, concentrating largely on best-sellers and no-brainers, piling them high, discounting them savagely, and largely ignoring writers who weren’t slap bang in fashion or likely to make shed-loads of money. I trust readers to distinguish the good from the bad, and really like the way social media, as a form of word-of-mouth, is becoming important in terms of book publicity. It feels much more genuine somehow than leaving it all to established book reviewers who perceive everything from within the canon of the literary world – and often have an agenda of their own. 12. What about publishers relying on authors to self-market? I find this incredibly unfair. Well, I’ve been marketed and it wasn’t all that successful – and publishers tend to take the credit if it works, blame the book if it doesn’t. I don’t know. I am not a publicity hound by any means and would gladly hire a body double to do it for me! On the other hand it’s nice to have some sort of contact with readers, and if this helps with marketing, then that can’t be a bad thing. It’s embarrassing though and having been brought up with the phrases like, ‘Who do you think you are?’ and, ‘Don’t blow your own trumpet,’ and the like, it’s hard to do it without cringing. Absolutely not. Andrew comes in and plays the banjo when he makes his morning coffee, which drives me mad. Do you think getting noticed as a writer is more difficult now? It’s always been hard, there are more chances now that big publishers don’t have a monopoly. It’s heartening how often small independent publishers (who in the main care much more about the work itself than just how much profit it might make) are getting work on prize shortlists etc. I admire cats but have a dog. And walking the dog is part of my creative routine. I think the latter would be more realistic! 1. Do you come from a literary background? Absolutely not. Both my parents were keen readers and there were books in the house, bedtime stories and visits to the library, but I didn’t know any real in-the-flesh writers, and I saw them as special people. Although I wanted to write stories as soon as I was able to read them, it didn’t seem a realistic ambition. We were an ordinary family and I felt too ordinary. 2. What writers did you enjoy reading as a child? The first book I vividly remember was called ‘Seven Days with Jan’ – I can’t remember who it was by, but would dearly love to find a copy. It was about a young boy in (I think) Holland whose father owned a market stall. I can vividly remember one scene: it’s Christmas Eve and Jan is running through the market just as it gets dark, the lamplight shines on a pyramid of tangerines in their crinkly paper. I could see the scene and smell the tangerines and feel the excitement of Christmas Eve. That, I think is when I really understood the magic of words on a page. I loved Mary Renault and Henry Treece, anything about boarding schools (particularly the Chalet School series); the Pan Books of Horror Stories and I read my way through the works of Dickens when I was quite young too. 3. Did you write as a child? I loved writing almost as much as I loved reading, and I used to tell my sister stories in bed (we shared a room). There was a long saga about a woman called Mrs Garbage Disposal whose hair was rotting away because she wore too much make-up. Maybe I should have layed off the Pan Horror Books! 4. How did you get started as a writer? I can’t remember. Eagerly! It was something I was good at at school – maybe the only thing I was confident about. I used to find writing comforting. 5. Do you find writing easy? It varies. Some days the words just flow out, but you can’t depend on it. When it’s easy it’s the most wonderful and fulfilling activity – but when it doesn’t work it’s hell. 6. Describe your working day. I do a lot of teaching (of creative writing), so my routine varies depending on my other commitments. But let’s say it’s an ideal day and I have no teaching: I get up about 7.30, shower, do some yoga, eat breakfast, walk the dog and start writing at around 9-9.30. I write until lunchtime. In the afternoon I read or go out or do something like editing rather than actual first draft work – there’s only so much of that I can do in a day. It’s almost unheard of for me to write in the evening. 7. Do you do much research for your novels? It depends on the type of novel it is. I researched into religious cults for Chosen – part of this was memory work (which I would count as research). One of my brothers was involved in The Divine Light Mission when I was a young teenager and I would visit him in his Ashram and I carry some memories of that, and of how the experience affected him. I read a really interesting book written by a former Moonie about how to rescue family members from a cult, which explained how the brainwashing process works – fascinating. 8. Please guide us through the stages of one of your books – the ideas, the planning, the drafts, working with an editor, etc. 9. Do you show your work in progress to anyone? No. I only show my husband and occasional friends when I’ve gone as far as I can alone. 10. How did you manage to fit writing in with other demands on your time? Are you good at managing your time? You have to be to be a writer. I was with Hilary Mantel once when someone asked me how I managed to write with 3 small children. ‘She neglects them,’ was her reply! But they’re all safely grown up now and none the worse as far as I can tell. 11. Have you any special advice for someone wanting to write a book? Read and read and read, write and write and write and don’t be afraid to write rubbish first, you will! Cooking, walking the dog, reading and I’m afraid, watching too much television. Oh and a glass of wine doesn’t go amiss. 13. Who are your favourite living writers? Lorrie Moore, Alice Munro, Zoe Heller, Jonathan Franzen, T. Coraghessan Boyle, Tim Winton, Shirley Hazzard, Ian McEwen. Oh I could go on and on. 14. Who are your favourite dead writers? Charles Dickens, George Eliot, Katherine Mansfield, Patrick Hamilton, Jean Rhys, Elizabeth Taylor, Barbara Pym, John Updike … and on and on, again. 15. What do you like best about being a writer? I get a tremendous thrill when it’s going well. And I like managing my own time and wearing whatever I like. 16. Is there anything you don’t like about being a writer? I can be very scruffy and anti-social. When I’m deep into the first draft of a novel, it’s hard to make conversation, or get very interested in anyone or anything else. 17. Have you ever had a work rejected? 18. How did you first get published? After years as a secret and rather guilty writer – guilty because I was making no money and taking time away from my children – I went on an Arvon Foundation Course. It was hard to find the money and hard to tear myself way from my children – the youngest was only one – but I was determined. It was a great week and one in which I made a mental shift from feeling like a person who wanted to be a writer, to feeling that I actually was a writer. This first opportunity to share my work and measure it against it that of others and to have it read and evaluated by the tutors, Hilary Mantel and Clare Boylan, had a wonderfully liberating and galvanising effect on me. After the course, Hilary, who’d enjoyed the beginning of my novel, offered me the chance to show it to her agent, which, needless to say I accepted. He took me on at once and very quickly found me a publisher for Honour Thy Father, my first published, (but actually third) novel. The other two I look back on as apprentice pieces. 19. Do you hang out with other writers or stay away from the literary world? I live with a writer and have several friends who are writers – but I don’t think we think of ourselves as ‘the literary world’. I’m not sure what that really is. I have writer friends and non-writer friends and all are important to me. 20. Do you enjoy meeting your readers and talking to them? Very much so. I feel very grateful to anyone who reads my novels and interested in hearing their reactions.